Stirling Albion have one foot in the Scottish League One play-off final after a rampant opening half hour ensured victory over Annan Athletic. 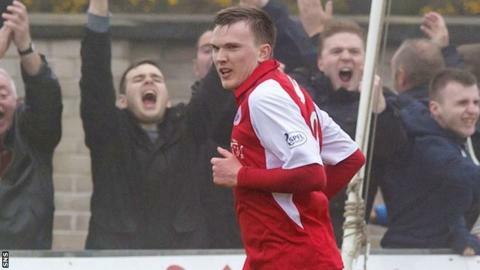 The Binos went into a 12th-minute lead thanks to Graham Weir's impressive lobbed finish. David Weatherston converted at the far post from a flick on from Jordan White, who also supplied the striker's second. Annan gave themselves some hope after the break courtesy of David Hopkirk's cool finish after 70 minutes. However, with Weatherston having taken his total to 11 goals for the season, Stirling have the advantage against the side that finished the League Two season a place above them in second place. The Binos are now unbeaten in eight games and also won on their last visit to Galabank in March, while Annan have only won once in their last five outings. Stirling: Crawford, Hamilton, Chris Smith, Forsyth, Johnston, Comrie, McClune, Darren Smith (Bishop 64), Weir (Cunningham 89), White, Weatherston (Ashe 78). Subs Not Used: Fulton, Reidford, O'Byrne, Ferry. Goals: Weir 12, Weatherston 26, 30. Annan Athletic: Arthur, Chisholm, Bradley, Watson, McNiff (Henderson 78), Brannan (Sloan 57), Andrew Mitchell, Steven Black, Hopkirk, Mackay, Todd. Subs Not Used: Davidson, Alex Mitchell, Swinglehurst, Love, Flynn.